OAKLAND, Calif. -- The family of an Oakland teenager who was declared brain dead after complications from surgery in 2013 plans to file a lawsuit Tuesday against UCSF Benioff Children's Hospital Oakland with new details about the allegedly botched surgery, CBS San Francsico reports. 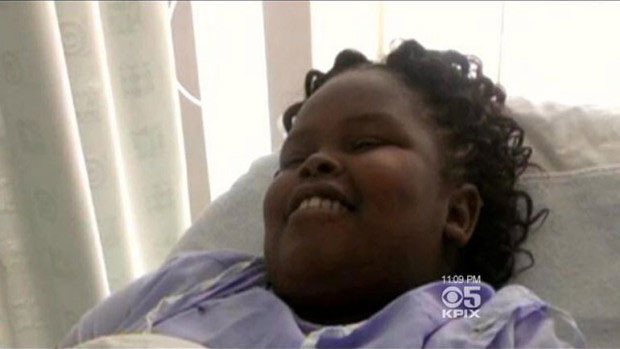 The 12-page complaint, which seeks unspecified damages, documents the hours following 13-year-old Jahi McMath's operation in December 2013, according to The Oakland Tribune. It details the loss of at least 2 pints of blood, her heart attack, a doctor arriving hours later and the hospital's plans to shut off the machines to harvest her organs. "If you read the medical records, it's just a pretty cavalier approach to the whole thing," the family's attorney, Bruce Brusavich, a Southern California medical malpractice attorney, told the newspaper. For the first time, the lawsuit provides the family's account of what happened after Jahi underwent a tonsillectomy and tissue removal at Children's Hospital in Oakland in December 2013 to treat sleep apnea. The girl suffered massive bleeding, had a heart attack and was declared brain dead three days later -- a designation her family disputes. Her family battled to keep her on a ventilator and to have breathing and feeding tubes surgically inserted. Under a court agreement, the family and the hospital agreed that Jahi's mother, Nailah Winkfield, could remove her from the hospital if she took responsibility for the girl's care. Over year later, Jahi remains on a ventilator and hooked to feeding tubes at a New Jersey apartment, and her case has ignited a debate over the definition of brain death. Officials from the hospital, aside from earlier court declarations, have not commented on the allegations because the family would not release them from federal patient confidentiality laws. In a statement released Sunday, the hospital said, "Our hearts go out to the McMath family," The Oakland Tribune reports. "As of today, Sunday, we are not aware of any litigation filed by the McMath family, but it is our policy not to comment on any litigation that might be pending."